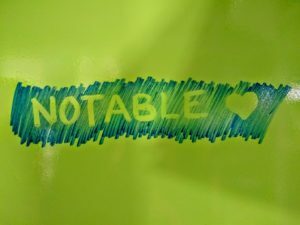 If you are looking for an affordable, easy to use dry erase paint, Notable is for you! 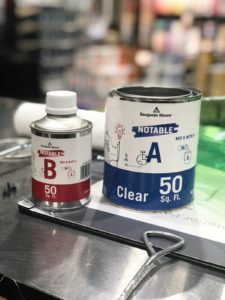 It comes in white or clear; today we will be demonstrating how to apply clear Notable paint over a bright color for a durable, dynamic look. 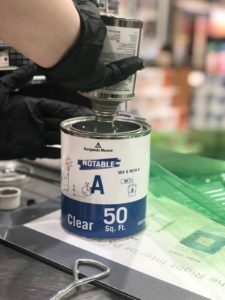 Painting with Notable is as easy as 1-2-3! Pour part B into part A and stir for 2 minutes. Do not use a stir stick with that has ink/paint on it because it can stain the paint. Do not shake! Notable can be applied immediately but must be applied within 4 hours of mixing. Do not use a plastic tray liner for rolling. Use in an area with plenty of ventilation. Brush to cut in the edges, if desired. Use the roller cover provided in the kit. The product should be applied 50 square feet at a time. Don’t overload the roller cover and use minimal pressure to avoid drips. Wait 5-10 minutes and then apply a second coat on the wet film. Any wet areas that need to be touched up must be don’t within 30 minutes. Wait 7 days for the paint to cure. Then, right away! 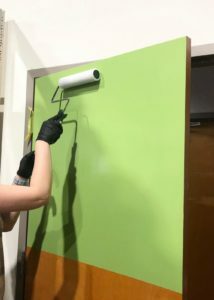 It is safe to use any standard dry erase marker and remove marks with any standard dry eraser. 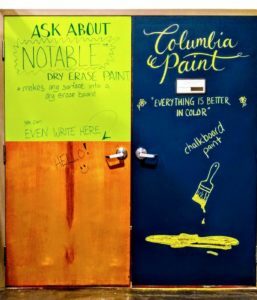 If you would like to use notable in your home or office, come see us at Columbia Paint or Clarksville Paint and Decorating Design Centers for one on one assistance. We are a Benjamin Moore Paint and Fine Paints of Europe dealer, and have over 300 wallcovering and fabric books. We also carry rugs, window coverings, and everything you need to paint your space.